Until the advent of planes, travel by water ruled. From lowly punt to Man o' War, boats and ships were not mere conveyance: the curragh, Fifie, and Zulu were history, culture and tradition. Along coasts, the sea was a way of life. Water was aligned with transport, trade, food gathering, warfare, technology, science, design, and communication. Ian Hamilton Finlay recalls this era using the vocabulary of ships and the sea as poetic metaphor. His poetry can be read variously as literature: A Calm in a Tea-Cup or like a painting. Some of Finlay's poems are like music: Two Nile sails, two silent turtle doves. He compares sea craft to wildflowers and birds, sails to waves. He reminds us of the eternal qualities of water, and (topically) that Louis XIV's cannons were inscribed: RATIO ULTIMA REGUM (THE LAST ARGUMENT OF KINGS). Five limited edition blankets inscribed with poems were made by the artist for this exhibition, which also includes a sculpture of 12 ship's bells inscribed with poetry. Ian Hamilton Finlay was born in 1925 in the Bahamas, where his father had his own schooner. Finlay is most famous for his garden near Edinburgh, which combines landscape, architecture, and poetry. His most recent museum exhibition was in 2002, at the Tate in St. Ives, England. 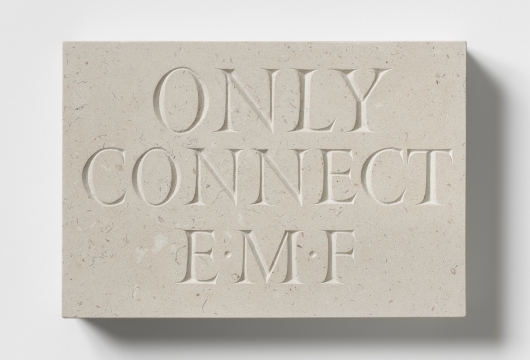 This is Ian Hamilton Finlay's fourth exhibition at Nolan/Eckman.